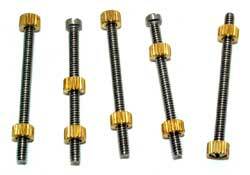 This is a package of 5 screw kits with stainless steel 4-40 screw, brass press-in nut, and brass ferrule. The screw is a fillister head style. This package provides a better pricing both for the screws and for shipping. You can request any of the standard lengths which I stock. If you don't specify length, or ask for one I don't have, I'll send either the 1-1/8 inch (which fits the most guns) or the next longer screw that I have available. You can always cut a long screw shorter, but it's hard to cut a short screw longer!